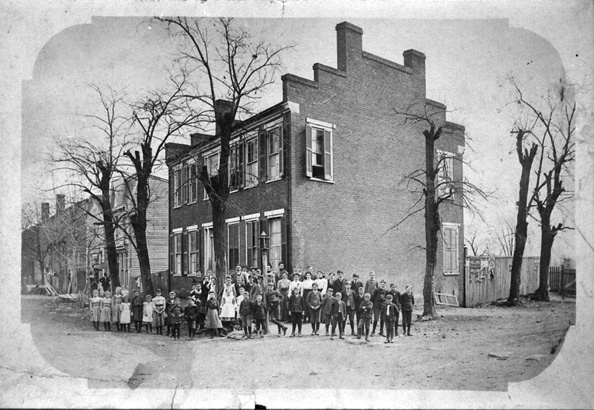 Comments: The Brady Building, located at the corner of Main and east Valley Street, served as the first public school in Scottsville from around 1876 to 1906. Its students and teachers pose with the school and a carbide street lamp as their backdrop. When Scottsville's 'School on the Hill' was built in 1906, the school at Brady was relocated. The Brady Building was later torn down, and its bricks were used to build the Harris house on West Main Street. The street immediately in front of the Brady Building's entrance is Main Street. The first building (white) to the left of this school was Dr. J. P. Blair's dental office. Once upon a time, the Scottsville School was in a large building on the corner of Main and Valley Streets, on the spot where the Masonic Building is now. Its front door opened onto the street; its large front windows were painted over to keep the inmates from looking out and passerby's from looking in. At the back where the firehouse and the water plant are now, a high board fence surrounded the long bare stretch of playground, the boys carefully separated from the girls as they played a limited game of ball, or jumped rope close to where Mink Creek runs under what is now the Coin Laundry. Nobody went in or out of that enclosure on a trivial errand such as buying a coke or an ice cream cone. When you were out, you were out, and when you were in, you were in. You were summoned or freed by the cracked notes of a bell on top of the building. Lunches were brought in boxes or baskets and placed on a shelf designated for that purpose; each pupil was responsible for his own midday refreshment. The curriculum was simple but thorough, for these were the days of reading, writing, and arithmetic, of slates and copybooks, of well-grounded Latin in the upper grades. The first grades were presided over by Miss Willie Hickock, who taught two generations of Scottsville natives. In a long, cobwebby room with big wood stoves, row after row of heads bent over ink-stained desks and well-thumbed readers while an occasional hand was raised to ask for permission to get a drink of water from the tin bucket on the shelf under the blackboard. The rules were rigid, the lessons drilled untiringly. On the other side of the hall, Miss Ella Farrar taught the middle grades, and upstairs the "big" girls and boys were in the principal's room where everybody met in the morning to sing a hymn and say the Lord's Prayer. In 1908, a new building was necessary, and the School Board met with much opposition in selecting the site on the hill where Mr. Haden Anderson now lives. Patrons said it was inaccessible and too steep a hill for their children to climb. There was enough approval, however, for the ground to be broken and the cornerstone laid with fitting ceremony. The gray frame building on a lot all its own, high above the town was a great change from the old schoolhouse on the pavement. Miss Ella Farrar and Miss Nannie Hill traveled in state in buggies drawn by reluctant horses, but their pupils chose the shortest distance between two points and scurried straight up the steepest incline. The hill was veined with private paths including a set of steps dug out at the back from which Miss Willie Hickock climbed into her buggy. This was the year, too, when Mr. William Day Smith became principal for a term of service lasting twenty-nine years. The school expanded rapidly, new teachers and new courses were added; the auditorium stage was taken for a classroom and finally a large new wing was built. With growth and development in all branches, it became an accredited high school, one of the best in the county. In 1924, it was time for another change, so the school came down from the hill again and was located in the present site at the end of West Main Street where it is crossed by Page Street. A large, low, brick building was erected with modern conveniences adequate to the needs of the times. There was a library, a kitchen to which soup in a large kettle was brought from various points and served to those in need of a hot lunch. An agricultural building on the same lot provided for courses in this subject, and a frame cottage across the road housed the primary grades. Mr. Smith, after long, productive years, retired in 1937 and was succeeded by Mr. Leslie Walton, a graduate of the school and a worthy successor. When Mr. Walton left to become assistant to the county Superintendent of Schools, Mr. Thomas Gillis took his place. Mr. Gillis was followed by Mr. John Boggs, during whose term from 1954 to 1958 a gymnasium, a cafeteria, and a laboratory were added to the big building with its growing enrollment. Mr. Thomas Allison, the present principal, was a teacher in the school before he became its head in 1958. Six new classrooms were added in 1962 and the primary school was moved to the main building, making one large well-equipped plant. "Still sits the schoolhouse by the road," sings the poet, but it is a long way from the old brick house on the street with its confining walls and high board fence to the present long, low-lying building with its green shrubs and open grounds, from the old cracked bell and horse-and-buggy travel to the big yellow buses which wait to carry children back and forth through the country at regular hours; a long way, too, from the few well-taught subjects of the old days to the variety of courses now handled by a faculty of twenty-four to a student body numbering between 550 and 600. But in education as in other things, a strong root in the past is a strong promise for the future, and Scottsville High School has a goodly heritage.